Giving back: Beryl Neilsen, who ran a Moranbah cattle property with her late husband John, is giving back to communities like theirs through education scholarships to young people in rural Queensland. CATTLE property owner Beryl Neilsen has made it her life’s purpose to give young people living in remote areas of Queensland a quality education. 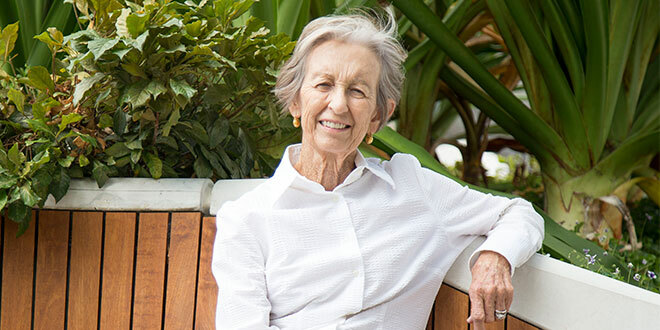 The Catholic woman originally from the West Mackay parish is the founder of the Winchester Foundation, which offers scholarships to young people in rural Queensland. The foundation is named after Winchester Downs, a cattle property near Moranbah owned by Mrs Neilsen and her late husband John. As Catholics are encouraged to give what they can to the poor and disadvantaged during Lent, Mrs Neilsen is someone who is generous in doing just that. Before Mr Neilsen died in 1989, he and Mrs Neilsen had discussed ways to boost education opportunities for the region’s young people. “When I first got married and went out into the bush, there was nothing out there,” Mrs Neilsen said. “We noticed, my husband and I, that there weren’t very many vets around for horses and cattle. When Mrs Neilsen sold her stake in the property, she decided to bequeath the proceeds when she died, but a friend convinced her to invest the funds and use it to help educate young people. “It was such a good suggestion that I could do it now,” Mrs Neilsen said. Since starting her foundation in 2011, she has provided almost $1.1 million in scholarships to 160 students living in Queensland’s rural communities. She was named in the list of Queensland’s top 20 most generous givers for 2017. Scholarships from Mrs Neilsen’s foundation covers all out-of-pocket expenses related to a child or young adult’s education, and this recently expanded to support the costs of boarding school and trade training. All the recipients are young people in rural and remote areas of Queensland who face the prospect of never going to school or university because of financial hardships or distance. Mrs Neilsen said young people in rural Queensland faced tougher challenges to their education than their city counterparts. “People just don’t understand what they go through out there,” she said. Mrs Neilsen attends the graduation ceremonies for all her recipients and once a year invites every one of them to her home at Winchester Downs for a lunch. “Some of them camp on the road to get there, that’s how much they appreciate it all,” she said. Mrs Neilsen believes her husband would be proud of the work she is doing. “I think he’s probably watching,” she said. In Brisbane city, Catholic businessman Karl Morris is also providing relief for families who can’t afford an education for their children. He and his wife Louise Morris were initial donors to the Mary MacKillop Brisbane Catholic School Access Fund to provide a Catholic education to students who would otherwise miss out. The fund was established in 2012 through the Archdiocese of Brisbane’s Catholic Foundation and named after Australia’s first saint. It has provided about $350,000 in bursaries to 22 children, and covers school fees as well as other out-of-pocket expenses like costs of retreats, technological devices or uniforms. The fund works in partnership with Catholic schools to contribute to the cost of the child’s education. The first recipient of the fund is expected to graduate this year. Mr Morris said education was the “greatest equaliser” for any child. “Once you’re educated, it doesn’t matter where you come from or who you are, you’re on equal footing with everyone else,” he said. Mr Morris and his wife put their five children through Catholic schools and praised the holistic approach of the sector. The couple are now ensuring families who can’t afford a Catholic education, including indigenous parents and refugees, can receive the same benefits. “It’s a broad Church of people that we’re bringing in and it’s children that would not have been able to go through a Catholic system without this support,” Mr Morris said. He said donors to the fund supported “a Church for the poor”. “Some of us have been blessed being able to help out and that’s what anyone that donates to the Mary MacKillop fund believes they’re doing, they’re helping out their fellow Catholics in times when they need a little support,” Mr Morris said.